summer is officially over. heather's two boys are back in school and my three oldest have started this week. come labor day weekend, the two littles will be in school too and for the first time in eleven years (yes, you read that, e - l - e - v - e - n years) i will have three hours, two days a week to myself. i won't know what to do with myself. i'm not going to lie, i'm happy to get back into the normalcy of routine. everyone in my family seems to function a little bit better with places to go and things to do. still, i'm a little nostalgic about the start of one more year in school. i have a middle schooler. i still don't know how that happened. with two in elementary and two in preschool, i know my days with this little crew of people are slipping away one year at a time. they are growing up and with each school year that starts, i'm more and more aware of how few years i really have with them under my roof. the days are long and the years are so, so very short. with that realization playing in my mind, heather and i have been working on prioritizing our lives. we are trying to keep the important things in their rightful place as important things. we are giving ourselves permission to take time with our kids and enjoy them. if that means that we don't do as many blog posts over the summer then so be it. we're working on embracing our priorities and our choices...guilt free. does that mean that our summer blog posts have been few and far between? absolutely. does it also mean that we got to create amazing memories with our kids and actually be present in their lives this summer like we haven't in the past. it does indeed. the best part of this process (let's just call the process "growing wiser with age") is that we are learning to brush off self criticism in the process. 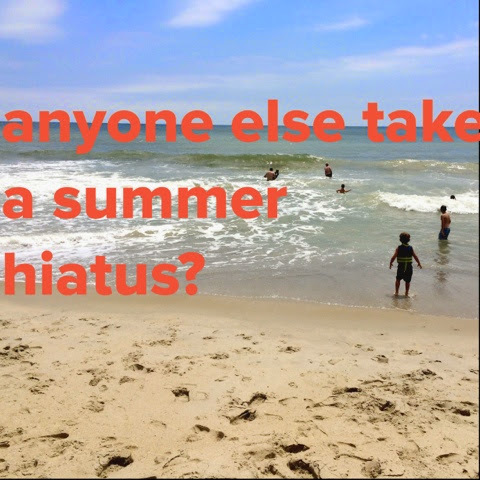 when my now middle schooler leaves the house in seven years, am i going to look back and say, "i really wish i had written two posts a week that summer instead of one?" probably not. so we are wiping the slate clean for ourselves and erasing the self guilt of not doing "everything" that we could be doing in during the day, many times at the expense of our kids or (and here's the hardest one to value) at the expense of ourselves. we are learning not just to prioritize our families but also ourselves. that is truly revolutionary for us. so, here we are. we are officially back to routine. our blog posts will increase. our lives will get back into a rhythm. there will be less than 200 "mommy" yells a day. and that is both wonderful and sad at the same time. we have missed writing. we've missed our own blogging routine. we are glad to be back....but we are also so very glad we took time this summer to do some guilt free prioritizing. it was necessary and for us, it was the best decision we could have made.